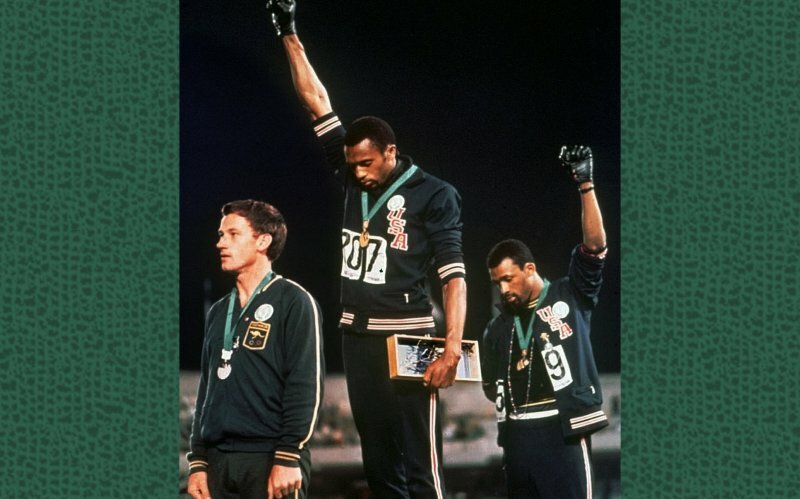 Forty-eight years ago, Tommie Smith and John Carlos stood together on a podium during the 1968 Mexico City Olympics and carried out one of the most powerful silent protests the sporting world had ever seen. The two sprinters, who had just won gold and bronze, respectively, in the men’s 200-meter race, waited for the National Anthem to begin, before bowing their heads and eachraising a black-gloved fist in the air. Their act of political subversion was a response to International Olympic Committee President Avery Brundage’s support of apartheid South Africa and Rhodesia, Brundage’s and the IOC’s history of racism and anti-Semitism, as well as a show of solidarity with victims of human-rights abuses around the world. The protest promptly earned them both a suspension from the U.S. Track and Field team and a tidal wave of “shut-up-and-play-the-game” histrionics from American sportswriters, who were still clinging to the age-old sports journalism trope that athletes—especially black athletes—should comment on little more than home runs and touchdowns. Perhaps no one weighed in with as much vitriol as a then-unknown Chicago-based sportswriter named Brent Musburger. Yes, that Brent Musburger. That mild-mannered and unthreatening television sportscaster whose velvety voice has been the soundtrack to your Saturday and Sunday afternoons for nearly 50 years. He was your introduction to the NFL, the NBA, and college bowl games. He looks like your goofy uncle. If not at the Olympics, then perhaps it’s worth asking him, today, how he feels about political statements being made on a basketball court or a football field? Or, better yet, how about on the stage of an awards show broadcast by ESPN—Musburger’s employer—that honored Smith and Carlos in 2008 with their Arthur Ashe Courage Award? Neither ESPN nor Musburger responded to emails seeking comment. Carlos, who played briefly in the NFL and later became a counselor and track coach at Palm Springs High School in California, says he’s encouraged by what he calls a “rising up” of young, black athletes who are no longer afraid to speak their minds, as well as a more accepting media that finally understands the power a superstar athlete’s voice can carry. So what of Musburger, then, in this new era of embracing athlete activism? Just before the last summer Olympics in 2012, Carlos told The Nation’s David Zirin (who dug up Musburger’s long-mothballed Chicago American column and reprinted it in full) that the two have never spoken. “Every time I’ve been at a function or an event with Brent Musburger, he heads the other way,” he said. As long as ESPN continues to pay Musburger to talk about sports on television (albeit now in a significantly reduced role), the network is condoning his silence, which is especially problematic at a time when police violence against people of color and simmering racial tensions are dominating the news and inspiring more athletes to speak out. So wouldn’t this be a great time for Musburger to tell us, on the eve of another Summer Olympics, that the 2016 version of himself no longer agrees with what that opportunistic 29-year-old sportswriter wrote all those years ago? That he can at least appreciate the decisions made by James, Anthony, and others to speak their minds and try to use their influence to push for social justice? And, wouldn’t it be a load off his mind to let Smith and Carlos know that he regrets comparing two brave athletes to the thugs Hitler assembled to help aid his rise to power in Germany?